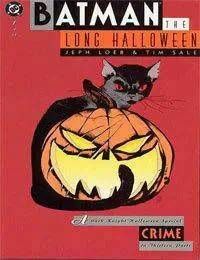 This ambitious Batman caper ran for 13 months, from Halloween 1993 to Halloween 1994. In it, the Caped Crusader joins with police captain Jim Gordon and district attorney Harvey Dent to get the goods on Mob boss Carmine Falcone. Meanwhile, a mysterious serial killer targets members of Falcones gang. Contrasting with that Godfather-inspired story line are early appearances of such colorfully garbed Batman adversaries as the Joker and Catwoman.